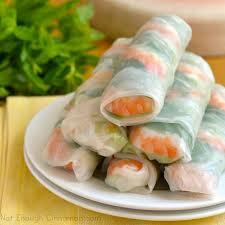 As the holidays approach, the Diversity Committee would like you to try Vietnamese Spring Rolls (Guo Cuon). This delicious and healthy appetizer, everyone is sure to enjoy! Have all meats precooked and cold and the rice noodles prepared already (the noodles should be white, long and at room temp). Make sure all veggies and herbs are cleaned, dried, and set out before you start. Dip a sheet of rice paper wrapper into water very quickly, no longer than a second or two (or they will get too soggy) and lay flat on a work surface. On one edge, lay a small handful of noodles, a few strips of meat, some shrimp, some cilantro and mint leaves, a lettuce leaf, some cucumber strips and bean sprouts, all to taste but don’t overstuff. Carefully start to roll up eggroll style, tucking in the sides, and then continue to roll up-but not too tightly or the spring roll will split. Serve immediately- these do not keep for too long and will harden up in the fridge, so it is best to make just as many as you plan to serve (store any extra unassembled fillings in fridge and roll later). This entry was posted in Community and tagged Diversity COmmittee, recipe, vietnam, Vietnamese Spring Roll by Mallory Benz. Bookmark the permalink.